ASEAN’s EU Parliament Chairman presses Laotian officials to act. The European Union has put the case of the prominent development worker Sombath Somphone back on the international agenda, threatening to review foreign aid to Laos after officials there failed to offer a credible explanation for his disappearance 11 months ago. Speaking on Australian radio, Werner Langen, delegation leader and Chairman of the ASEAN delegation in the European Parliament, also said Laos could become isolated in the Association of Southeast Asian Nations (ASEAN) if the human rights situation in the country fails to improve. “In our view, it seems to be impossible that the government knows nothing on this case. It was a disappearance under the guise of the Laos police and we say to the government we need a life sign, first of all. We need a life sign of Sombath,” he said. With the exception of Singapore, ASEAN has, however, failed to act on Sombath’s probable kidnapping and possible murder, casting doubts on the group’s ability to do little more than trade among themselves. Equally, the authority of Prime Minister Thongsing Thammavong has been found wanting. His failure to provide any explanation at all has raised doubts over who is in charge – his communist party or the police. Langen has just returned from Laos and was part of a second EU delegation to visit the country this year. After his first trip, in August, Langen concluded that the country was in a state of denial in regards to Sombath and as a result his case will now be discussed in the European parliament. CCTV footage of Sombath surfaced shortly after he went missing on December 15, 2012. He was stopped by police on a major road and taken away by two unidentified men. The Laos government has rejected offers of forensic help from the EU and U.S.
Last month, Sombath’s Singaporean wife, Shui Meng, pleaded for her husband’s return. She said that he needed medical attention and promised to leave the country and live with him in quiet retirement. 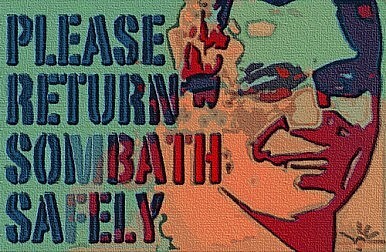 “All I want is only the safe return of Sombath,” she said. Previous calls have been made for donor countries to think twice before handing over taxpayer dollars to a country that still behaves like a police state. “The human rights group calls also on other countries to do more to demand that the civil society leader, a victim of enforced disappearance, is found and returned safely to his family,” Rupert Abbott, Amnesty International’s Researcher on Cambodia, Laos and Vietnam, said recently. Scrutiny from human rights groups and charges from the ICC likely if officials don’t come clean.